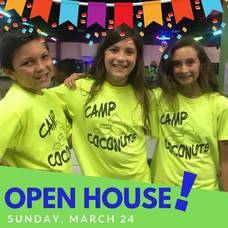 Join Camp Coconuts for their next fun filled Open House! Sunday, March 24, from 12pm-3pm. Activities include meet and greet with friendly staff, tours, games, registration incentives and camp details including an overview of all of the traditional and new elective programs for 2019. FREE family ice skating from 1pm-2:30pm (skaters dress warm and bring your helmets!) Need Skate Rentals? They are complimentary from Camp Coconuts. COME AND SEE WHY KIDS AND FAMILIES LOVE CAMP COCONUTS!! In addition to all of Camp Coconuts proven programs many new programs are in place for 2019: In addition to all of the swim programs in our 3 outdoor pools, ice skating, ice hockey, various sports, music, etc... Camp Coconuts has implemented many new STEAM programs, zip lining, yoga, gardening,...and so much more.. Go check it out Sunday, March 24th!